The Organic Maxi Pad & Insert set features a leak-resistant core and is adjustable to accommodate light, moderate or heavy menstrual flow. Increase the absorbency of the Pad by adding one ore more Inserts. You can also change Inserts throughout the day approximately as often as you would change a disposable pad. 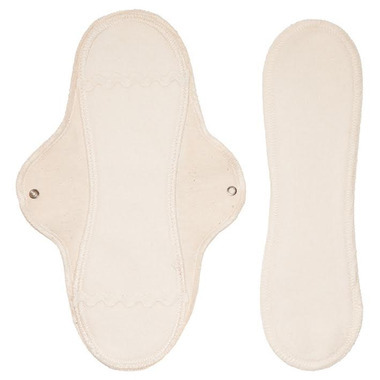 Organic Maxi Pad & Insert are both 10" / 25.5 cm in length and 2.5" / 6.5 cm wide when snapped. Additional Maxi Inserts can be purchased separately. I am soooooo excited to see these on here!!! I have used lunapads for the past 10 years and am due to order some new ones!! They work amazing and last forever...this will only be my third time buying feminine pads in the last 10 years.